The National Deaf Center on Postsecondary Outcomes (NDC) recently launched Deafverse, an interactive game for the deaf and hard of hearing student community. With this game, the NDC offers a valuable and engaging tool to help students develop self-advocacy and self-determination skills, while experiencing real-life scenarios, with a focus on accessibility rights. The game is currently available in English and American Sign Language (ASL). It can be played at home, school, transition programs, or vocational rehabilitation settings. 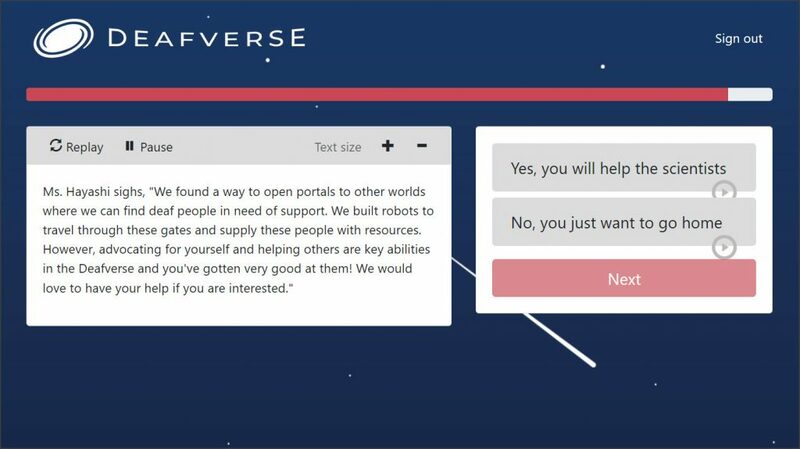 Deafverse is a free, interactive online game, available for computers and mobile devices. The game takes place in an imaginary universe, where robots employing Artificial Intelligence (AI) are available to help people with disabilities. In the current “World”, a deaf high-school student finds a [friendly? – sorry, but no spoilers!] robot, in need of help. The student is then faced with several challenges and conflicts. These require him to use his empathy, self-awareness, intelligence and critical thinking skills to be able to “save the world” and improve the accessibility tools available for the deaf and hard of hearing community. Life in and after high school can be challenging for the deaf and hard of hearing. Will there be the accessibility tools I need in order to be a successful adult, fully integrated into our society? This game provides deaf students a unique “virtual” social experiment by allowing them to engage in the type of situations found in real life, and assess how they can respond to each challenge. It also helps them find the right accessibility tools for each situation, whether in college, school, the workplace, or public places. Knowing how to address an accessibility issue, for example, during an emergency, and how and who to ask for help, are some of the situations the player is faced with. This virtual environment is perfect to test critical thinking skills and engage in behaviors that promote empathy, respect and self-determination.